***image5***Three items jump to the foreground of the disappearing honeybee issue: EMF radiation; GM crops; and the deep pool of understanding provided by Rudolf Steiner’s anthroposophy. However, the intent of this article is to focus on the third element, the Steiner connection, which promises to deliver a body of material worthy of extensive contemplation. Rudolf Steiner, arguably the best kept secret of the 20th Century, foresaw almost a hundred years ago that the bees would likely begin to disappear if humanity continued to tend the community of bees by artificial means. 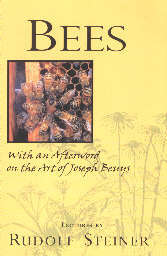 In addition, in his series of lectures on “The Bees,” he gave numerous indications to portray the intricate and compelling nature of this aspect of the eco-community. In capsule, Steiner warned against both mechanizing the process of bee-keeping and artificially breeding the queens. More than this, he also gave detailed information ranging from the inner workings of hives to fairly lofty esoteric considerations. Earth Vision holds that the first step in addressing an issue within the realm of nature is to hold the being, in this case the Spirit of the Bee, in our consciousness. If enough human consciousness takes the bee under its wing, so to speak, we will be halfway to solving the issue. The community of bees comprises a mysterious membership in the ecosystem, a masterpiece in conception. Hives are complex workplaces of rarefied intent. Honey, gathered from aspects of plants that are spiritual in nature (flower blossoms are composed more of etheric and astral energies, than physical substance) is a godly elixir, immune to earthly forces of decomposition. A small amount of honey ingested at a time has a wonderful effect on the human constitution, especially for aging members of the human community. Beekeepers are now called upon to acquire a metaphysical understanding of bees, and the complex masterpiece of the hive, and to work with the bees with nothing short of reverence. Taking nature to a new level. The Earth Vision website presents spiritual ecology, the interweave of nature and soul, by addressing current issues, as well as through five books that explore spiritual ecology by means of the following approaches: geographic; seasonal; art, history/reincarnation, and humor. Dubbed “a modern Thoreau” by one reviewer, Josef Graf’s diverse background was bound to culminate in the Earth Vision project. A split degree in Sociology/Ecology was followed by work as a trail guide, co-ordinator of a nature interpreting program, assistant to Native cultural enhancement, radio host, and Waldorf teacher. Blending this array of experience with graduate study in the “university of wilderness,” plus two decades of anthroposophical research to penetrate to the heart of both human and wild natures, has generated the spiritual ecology of Earth Vision.